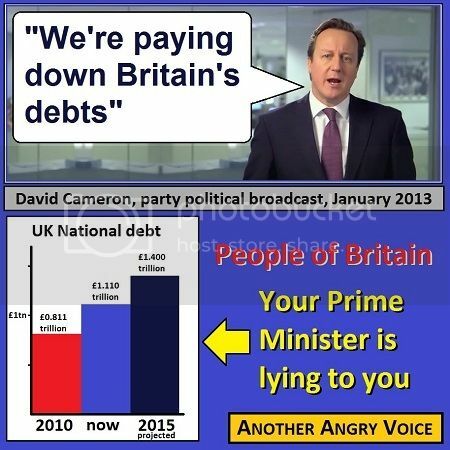 "We're playing down Britain's debts"
At the moment debt for countries like the UK is really cheap. Investors are willing to take on long term government bonds at 1% or less. Which means that whilst our total interest payment in financial terms is high, as a percentage of total borrowed it is going down as more debt is converted to long term low yield bonds. A sensible government would be taking advantage of this to spend money on infrastructure investment. Which would bring money in the form of taxes back into the exchequer. Not that we are likely to get a government with the sense to do this. so who do we owe the debt to? some usa bank? if so would be cheaper to renege the debt and declare war on them haha,! Camerons government ıs borrowıng money to gıve away ın forıegn aıd---now that really makes fınancıal sense doesn,t ıt?? Seems to me,and i aint no genious, but if your picking on the guy for doing a better job than any of the others could have done with our debt, then what chance has he got with all the other stuff he not done so well with, i really cannot wait to see who ends up running this so very very hard to please country. maybe this is one of the reasons Martin, It seems the debt has increases under this Government, well worth a read, but note who he is.